In the online collection of the National Archives in Washington, D.C. the authors recently came across a fascinating film entitled "Anti-German Propaganda" that was produced by the American government in 1917-1918. First a warning to anyone who would like to see this footage: the film has very graphic contents showing dead soldiers and children. It is a strong example of World War I atrocity propaganda in which the Germans are shown as the ultimate bad guys. The American film studios during World War I produced many propaganda movies and a lot of these films are by modern standards absolutely outrageous. This film is something completely different. It isn't drama - the movie is compiled from documentary footage and still photographs. The pictures were clearly distributed to arouse antipathy toward the German war effort. 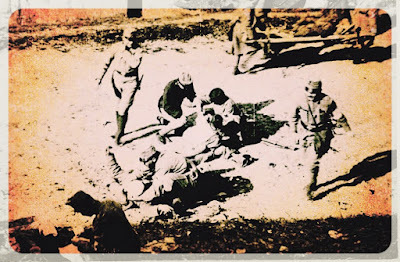 Pictures show dead Germans in trenches, the Kaiser inspecting troops, dead women and children piled in a field, German troops retreating, captured Germans in a stockade, and French families inspecting their rubbled homes. Films show German troops in close-order drill, doing excercises and engaged in infantry and cavalry maneuvers, French refugees trudging along a road and Allied prisoners being guarded by German troops. The technical quality of these pictures is outstanding. We also recognized the scenes showing the German troops in close-order drill. These were shot by American newsreel cameraman Ansel E. Wallace who went to Germany in December 1914 for the Hearst-Selig News Pictorial. This footage was taken in Frankfurt am Main. We found it in the Allen Collection at the Library of Congress but could not publish it because of copyright issues. This footage from the National Archives however is in the public domain and can be watched without any restrictions. Ironically, the Wallace footage of troops on the drill field at Frankfurt am Main was shot in 1915, two years before the United States got into the war. And it was made at the order of William Randolph Hearst, who was then pro-German, and with the direct blessing of the German Foreign Office -- another demonstration of how a film shot can often be exploited for almost any propaganda purpose. You can read more on Wallace's film work during World War I in our book American Cinematographers in the Great War (2014). We have uploaded this anti-German propaganda film on our YouTube channel. Long before the United States entered the First World War, American films capitalized on the notion of an active involvement of their country in the Great War. 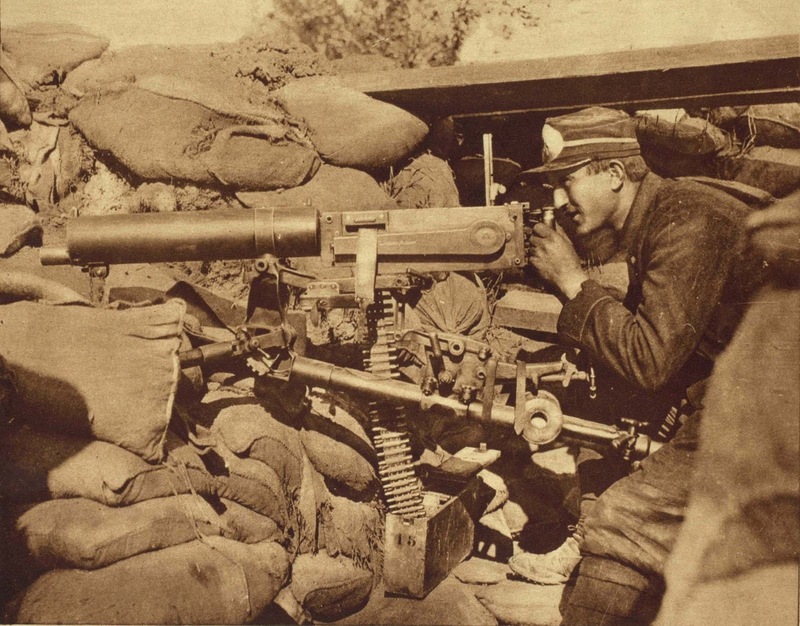 One of the best examples is Our American Boys in the European War, a four-reel film released by the Triangle Film Corporation in the summer of 1916. This documentary film pictures the American Field Service, an organization of volunteers driving ambulances behind the French frontlines, as well as the American pilots that joined the Lafayette Escadrille on the French side of the war. Long considered a lost movie, the film has been partially retrieved. Two reels of a revamped version were found recently in the film collection of the Library of Congress. This version was released in the United States in 1917 as Our Friend France and has some additional scenes. For a country that was strictly speaking neutral at the time when this film was first shown, it is somewhat surprising that this movie was released. But one should not forget that when the German army closed in on Paris in 1914, many members of the American colony rallied to the French cause. Its two prime movers, former U.S. ambassador to France Robert Bacon and Mrs. William K. Vanderbilt, persuaded the French government to provide facilities for taking care of wounded French soldiers at the American Hospital at Neuilly-sur-Seine, a little suburb northwest of Paris. 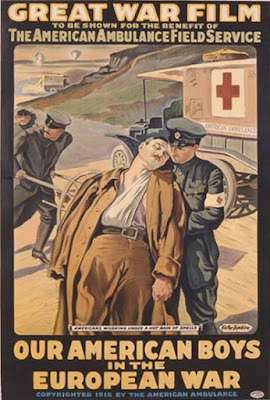 The next step was to set up operations for an American ambulance service, which came into effect around June 1915. Somehow in 1916 the American Field Service managed to close a deal with the Triangle Film Corporation and with the assistance of the French authorities Our American Boys in the European War was produced. According to Ed and Libby Klekowksi in their excellent book Eyewitnesses to the Great War, the film was shot in the vicinity of Pont-à-Mousson, in the Lorraine, which was a relatively quiet frontline sector. Although the Triangle Film Corporation in some press releases claimed the company had sent its own cameramen to Europe this is highly unlikely. Most of the footage was probably made by official cinematographers of the French army, and some scenes were spliced in that were also used in other American films, notably Donald C. Thompson's War As It Really Is (USA, 1916). Our American Boys in the European War premiered in July 1916 at the Hotel Majestic in New York City. Special benefit shows for the American Field Service were arranged that summer for members of the East Coast high society at fashionable seaside resorts. The film not only was an important fund raiser for the American Field Service. It soon also became a significant propaganda instrument for the preparedness movement in America. Although the enemy was not mentioned in the speeches that accompanied the presentation of this film, it is clear the movie was used for pro-French publicity, as well as promoting a stronger national defense in the United States. As an example, the trade paper Moving Picture World reported the film was shown in September 1916 at the Plattsburg military training grounds in New York under the auspices of the 9th Regiment. When in 1917 America entered World War I the Triangle film was shown again and soon a new version was edited, which included additional shots such as a scene showing the French General Rageneau conferring the Cross of the Legion of Honor upon A. Piatt Andrew, organizer of the American Field Service. This revamped film also has an appropriate introduction by General Joffre, commemorating French-American friendship dating back to the American Declaration of Independence. This footage must be a compilation of at least three different film versions, because there are at least three different styles of intertitles. A number of shots in the first film (about the first 20 minutes) are also scattered through the John E. Allen Collection at the Library of Congress. In the early days of American film history production companies frequently deposited frame enlargements at the Library of Congress for copyright application purposes. Many of these reproductions can now be accessed online and are an important source for identifying lost films. "Bandaging the Wounded". Film scene showing Austrian Red Cross soldiers in action at the Eastern Front. From Albert K. Dawson's World War I feature film The Battles of A Nation (USA, 1915). Frame enlargement from the Library of Congress' Prints & Photograph Division. While researching our book American Cinematographers in the Great War we found a number of frame enlargements that had been deposited by the American Correspondent Film Company. The dates on the backside of the pictures, as well as the name of the production company, all pinpointed to cameraman Albert K. Dawson (1885-1967). 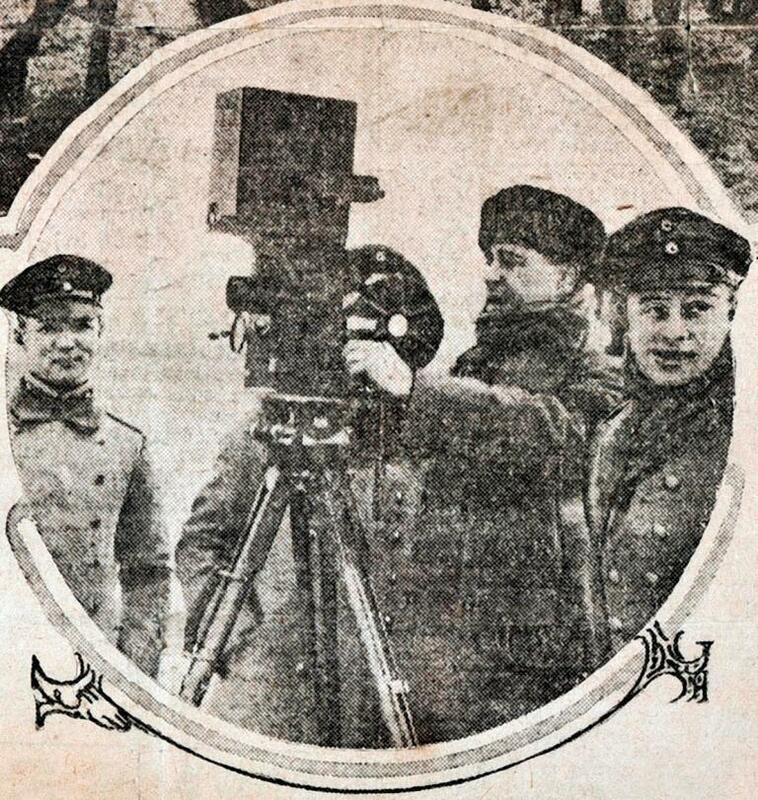 From 1915 Dawson worked for this film company and he accompanied the German as well as the Austro-Hungarian and the Bulgarian army in wartime Europe. At the time of our research these frame enlargements had not been digitized by the Library of Congress, but now the pictures can be viewed online. Dawson's pictures are in a special World War I collection named "Selected copyright deposit photos of the First World War" (Lot 880). Some of these pictures are scenes from his war films The Battle and Fall of Przemyśl and Battles of A Nation (1915). Others are regular press photographs taken by Dawson during his trench tours along the Western and the Eastern Front. We have uploaded Dawson's pictures from this collection on our photo channel. When the United States entered World War I a professional campaign machine was established to get the American people behind the program. Launched by America's wartime propaganda agency - the Committee on Public Information (CPI) - this publicity drive was on a scale people had never witnessed before. 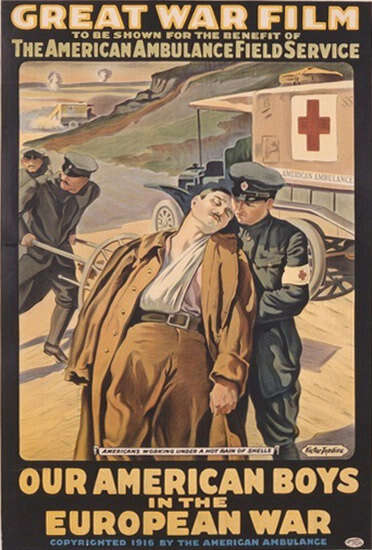 Posters, lobby cards and advertisements all contributed to promoting the CPI official films of the Great War. The films produced by the CPI ranged from shorts to an official war newsreel and three feature documentary films: Pershing's Crusaders, America's Answer and Under Four Flags. All movies were boosted by a professional publicity campaign which included special screenings, direct mailings and the use of theatrical techniques to produce a stunning presentation. As an example, when in 1918 America's Answer premiered in New York City the curtains were raised and the stage revealed one hundred U.S. sailors singing the national anthem, followed by the theme "Over There!" which was accompanied by a breathtaking musical 'artillery barrage'. The audience when seeing and hearing all this was electrified. 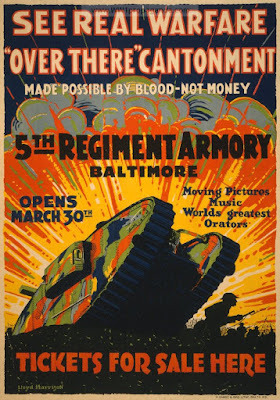 As an interesting illustration of how these official war pictures were turned into a "show" we have collected a series of film posters, lobby cards and movie advertisements which were used by the CPI throughout the United States to promote America's involvement in the Great War. You are free to download these publicity pictures here on our photo channel. During World War I leading American newspapers took advantage of a new printing process that dramatically altered their ability to reproduce images. Rotogravure printing, which produced richly detailed, high quality illustrations was used to create vivid new pictorial sections. This new technique also made it possible to produce special war pictorials on an unprecedented scale. Beginning March 29, 1914, the New York Times became one of six US newspapers to regularly publish rotogravure art sections as a separate section, mid-week and on Sundays. The Times later compiled images from these sections into a book entitled The War of the Nations: Portfolio in Rotogravure Etchings. This volume included images from the New York Times mid-week pictorials published from the start of World War I in 1914 until the signing of the Armistice in 1919. Most of the Sunday edition pictorials have been scanned and digitized by the Library of Congress, and prove to be an important historical source. While researching our book American Cinematographers in the Great War we frequently used the New York Times War Pictorial section. Because many of the war photographers that we researched handled both a still and a movie camera their work also turned up in the war pictorials that were published in this newspaper. A selection of pictures by American cameramen, published in the New York Times War Pictorial, is available here on our photo channel. 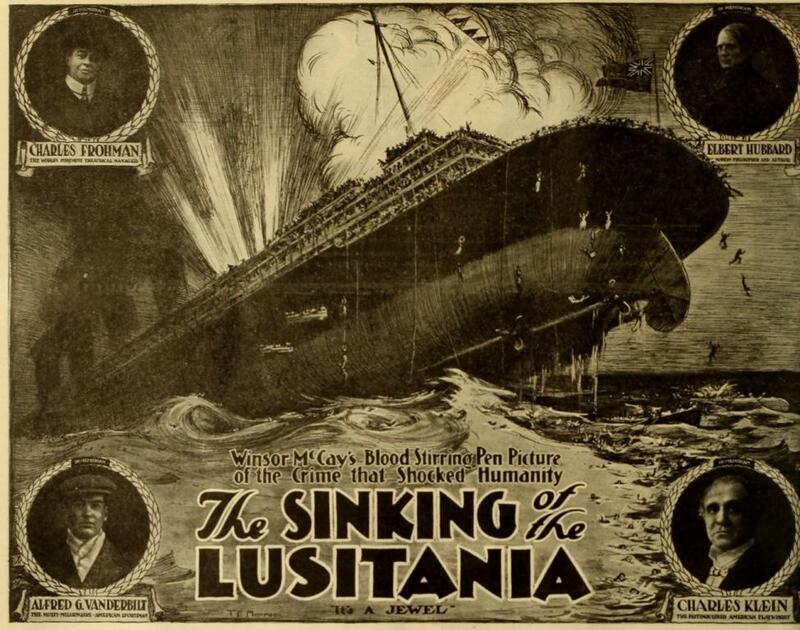 In 1918 American cartoonist Winsor McCay recreated the never-photographed sinking of the British liner RMS Lusitania. At twelve minutes it has been called the longest work of animation at the time of its release. The film is also the earliest surviving animated documentary. The sinking of the Lusitania by a German submarine outraged McCay, but the newspapers of his employer William Randolph Hearst downplayed the event, as Hearst was opposed to the US joining World War I. McCay was required to illustrate anti-war and anti-British editorial cartoons for Hearst's papers. In 1916, McCay rebelled against his employer and began to work on this project on his own time with his own money. It took him 22 months to complete the film. The animation combines editorial cartooning techniques with live-action-like sequences. The intertitles emphasized that the film was a "historical record" of the event. The movie has a dark mood and strong propagandist feel. It depicts the terrifying fates of the passengers, such as the drowning of children and human chains of passengers jumping to their deaths. The artwork is highly detailed, the animation fluid and naturalistic. McCay used alternating shots to simulate the feel of a newsreel, which reinforced the film's realistic look. There are several versions of this remarkable World War I film online. The best copy we could find was uploaded in 2015 by Tina Chancey and has an improvised musical score.